To live up to our promise of being your Prompt & Proven Lawn Sprinkler Service provider, Sean Mullarkey recently achieved the highest-echelon irrigation certification from the Irrigation Association. 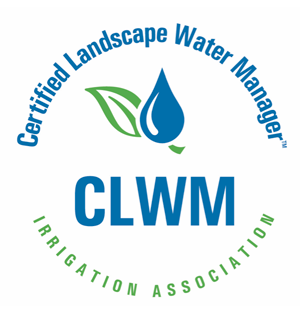 He is now the only Certified Landscape Water Manager in Ohio and Kentucky, and there are fewer than 100 Certified Landscape Water Managers in the world. evaluate site conditions and determine water availability and use requirements. have working knowledge of general irrigation theory, including hydraulics, soil-plant-water relationships, water requirements and electricity principles. understand irrigation equipment selection, use, restrictions and installation methods. identify and implement system upgrades and modifications, and manage the control system to provide the most efficient irrigation possible. provide direction to the end users on system use, scheduling, maintenance and water conservation. Certification is a lengthy and intensive process. Sean passed a rigorous, four-hour exam, demonstrated commitment to the association’s code of ethics and agreed to at least 20 hours of continuing education units per two-year cycle. This capstone certification puts TriState Water Works in an elite group of lawn sprinkler repair and maintenance providers, and we are proud to bring this expertise to your irrigation system. [VIDEO] How Long Will My Irrigation Spring Start-Up Take? Subscribe to receive our latest White Paper, How To Save 30% or More on Your Sprinkler System Water Cost. You’ll also receive periodic water savings news, tips and advice you can use. For landscape lighting, visit our sister company, LUX Landscape Lighting.